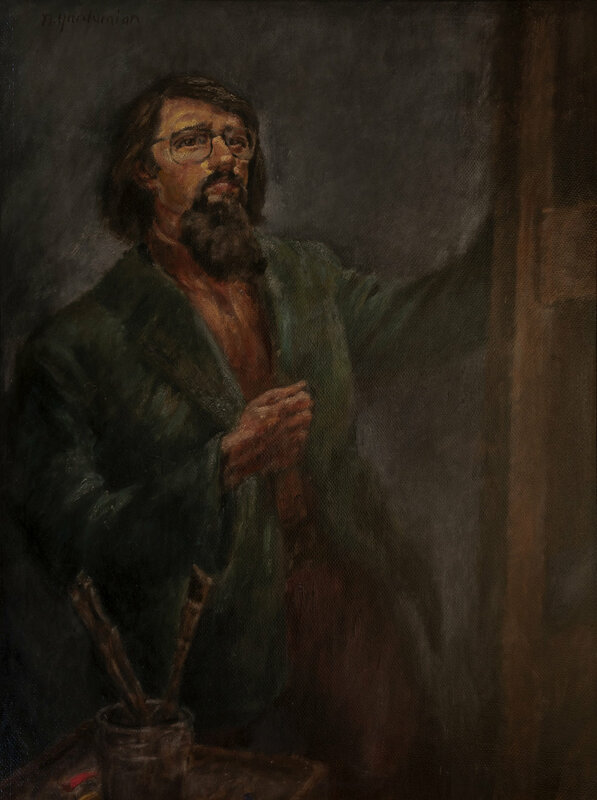 "A Window to the Soul: Nishan Yardumian's Biblical Art"
On Sunday, April 22, Glencairn Museum opened an exhibition of 22 paintings and drawings by the late Bryn Athyn artist and arts instructor Nishan Yardumian (1947-1986). A Window to the Soul: Nishan Yardumian’s Biblical Art continues through Sunday, November 4, in Glencairn’s Upper Hall exhibition space. Nishan Yardumian’s art is uncompromising, technically and emotionally. His skilled use of the old masters’ techniques of underpainting and his layering of color and strokes give an unusually rich, lustrous quality to his oils. His skillful use of light and dark, and his ability to convey the finest, subtlest gradations, create an intensity of spirit that lends monumental feeling to even his smallest drawings. Whether a local landscape, portrait, religious theme or still life, his work conveys a depth of feeling and a radiant otherworldliness. Figure 1: Self Portrait. Oil, 1977. On loan from Siri Yardumian Hurst. Figure 2: Bethlehem. Luke 2:4-7. Tempera and oil, 1978. On loan from Siri Yardumian Hurst. Figure 3: Annunciation to Shepherds. Luke 2:8-14. Oil on canvas, circa 1975. On loan from Siri Yardumian Hurst. Figure 4: Noah Entering the Ark. Genesis 7:7. Oil, 1981. On loan from Siri Yardumian Hurst. Figure 5: Annunciation to Mary. Luke 1:26-38. Pen and ink, 1979. On loan from Miriam Yardumian. Figure 6: Supper at Emmaus. Luke 24:30-31. Oil on canvas, circa 1981. On loan from Kent Junge. Figure 7: Baptism of Christ. Mark 1:9-11. Based on 12th c. French capital at Glencairn Museum. Tempera. On loan from Stephen Morley. Figure 8: Descent from the Cross. Limestone capital, 12th c. (?) Spain. 09.SP.53. See Figure 9. Figure 9: Descent from the Cross. John 19:38-42. Pen and ink, 1977. Collection of Glencairn Museum, donated by Vera P. Glenn. Based on 12th c. (?) limestone capital from Spain in the collection of Glencairn Museum. See Figure 8. Figure 10: Descent from the Cross. John 19:38-42. Conte crayon, 1978. On loan from Michael Hogan. Figure 11: "Eli, Eli." Matthew 27:46. Tempera, 1985. On loan from Martha Gyllenhaal. Figure 12: The Three Crosses. Luke 23:33. Tempera, 1985. On loan from Siri Yardumian Hurst. Figure 13: Joseph Revealing His True Identity to His Brothers. Study. Genesis 45:1-15. Pencil, 1985. On loan from Siri Yardumian Hurst. See Figure 14. Figure 14: Joseph Revealing His True Identity to His Brothers. Genesis 45:1-15. Pen and ink, 1985. Collection of Glencairn Museum. See Figure 13. Figure 15: Annunciation to Shepherds. Luke 2:8-14. Pen and ink, 1978. On loan from Ken and Glynn Schauder. Figure 16: Annunciation to Shepherds. Study. Luke 2:8-14. Watercolor, 1977. On loan from Siri Yardumian Hurst. See Figure 17. Figure 17: Annunciation to Shepherds. Luke 2:8-14. Tempera and oil, 1977. Collection of Glencairn Museum. See Figure 16. Figure 18: Three Angels Appearing to Abraham. Genesis 18:1-15. Tempera and oil, 1977. Collection of Glencairn Museum. Visitors are welcome to tour A Window to the Soul: Nishan Yardumian’s Biblical Art, Tuesday through Friday as part of Glencairn Museum’s regular 2:30pm “Highlights Tour” and on weekends 1-4:30pm (walk-ins welcome), as well as by appointment and when attending the Medieval Festival. The exhibition is closed May 26 for a concert, and on July 4. Photography of the artwork courtesy of Edwin Herder.